Too many kids in America are falling behind in school and life before they even get started. Oftentimes, this is not due to alack of ability but to the lack of access to both basic tools, such as notebooks and pens, and to quality after-school programming that helps prepare kids for academic success and, inevitably, a great future. Our goal is to raise $500. So, will you make a difference? 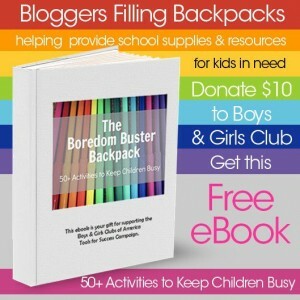 Everyone who makes a $10 (or more) donation will get the Boredom-Buster Backpack: 50+ Activities to Keep Children Busy ebook! This ebook is filled with amazing activities contributed by over 20 bloggers that will keep your children busy, learning, and having fun. Go to the Bloggers Filling Backpacks BGCA fundraising page and make your $10 donation for your copy of this awesome ebook! The ebook will be emailed to you after your purchase. Not only will you get tons of fun activities to do with your child, you'll help other children have the supplies they need to start school successfully! I ordered this book and it is FANTASTIC with many beautiful activities and color photos to show you step-by-step how to play and teach your child. The book is filled with activities on Art, Sensory, Math, Science, ABC Reading, Outdoor Fun, Bonus Fun Ideas, and Printables. You can find the Boys & Girls Club of America on Facebook, Twitter, or their Website. If you'd like to support this campaign on your blog, please feel free to grab the buttons below! Susan...this is wonderful...I will head over to donate (and enjoy some fresh new ideas in the e-book)...and also Tweet and post this to my Facebook. What a great idea! Vivian! Just sent you your ebook! I hope that you enjoy it! Thanks so much for supporting the BGCA! You are so welcome! And thanks so much for the ebook...I know I will enjoy it...I'm all about using crafts, along with picture books, to help kids build self-esteem! Just did a staff workshop, Building Literacy and Self-Esteem...One Picture Book at a Time, for our local Boys and Girls Club at their Annual Conference. I also grabbed the button and posted it on my blog sidebar and will mention this great cause in my next blog post! Thank you so much for grabbing the button! It will be resent. Thank you for letting us know and for sharing the post. You did all the work Andie! It is GORGEOUS! Hi! I will be looking forward to visit your page again and for your other posts as well. Thank you for sharing your thoughts about online fundraising in your area. I am glad to stop by your site and know more about online fundraising. Keep it up! This is a good read. Join United States Congressman Jim Himes for a priceless personal tour of the U.S Capital Building and lunch in the Members' Dining Room. Don't miss this unique opportunity to spend time with one of Connecticut's most valued elected officials, and tour the one of America's most significant landmarks.